I am so glad you took the time to punch up my web page. I study, collect, store and RE store old broadcast stuff. My wife reminds me occasionally, that it's gotten way out of hand. I have many friends who have sent me pictures of old stuff, and I happily publish pictures of same on these pages. If you have some vintage pictures, I invite you to share with the world. I get about 750 hits a week on this site which has been up since 2001. It all started at WCAS, 570 on your radio..
in a 1,000 watt radio station in Gadsden, Alabama. Well, for me, it did. My dad went to visit a business associate of his, who officed in the Pioneer Life Insurance Building in Gadsden. Luckily for me, this structure also housed, WCAS 570, a 1KW daytimer, (then). I watched Doug Robertson through the tilted double pane window, as Doug played 45's on CB-100's, talked into an RCA 77D and it all plugged into a GATES SA-40. Right then and there, (history books have failed to note) I got the RADIO BUG! Since that day in 1957, that is all I have wanted to do, and since October 1963, thats about all I have done. This is about what I saw that faithful day...In the photo Chester Studdard sits at that console and mike. 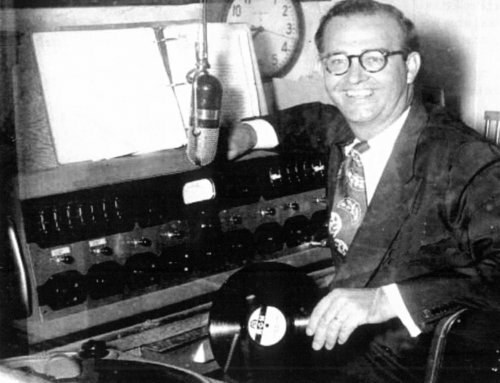 Check out that 78 rpm record in his hand. WAAX Big WAAX "The Station You Hear Everywhere"
Since I got the radio bug from the above station, I guess it was my destiny to someday work there. In fact I did, twice, as a "kid" from 1964 till 1966, and again as a "pro" starting in 1970. 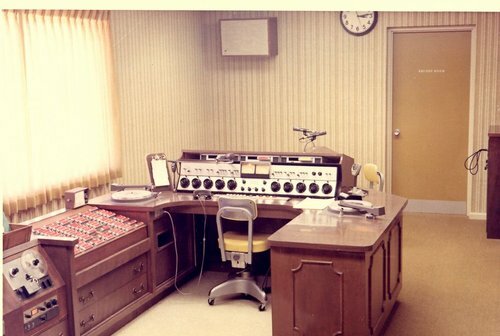 Here is what the control room looked like when I was there in the 70's. Pretty slick for a medium market station. My sincere thanks to Carl Sampieri for the photo, and to Mike McDougald for building the studio and giving me a job.